Glenavon may be riding high at the top of the Danske Bank Premiership, but Jonny Tuffey is keeping his feet planted firmly on the ground. The Lurgan Blues hold a one point advantage over Linfield at the summit, but Tuffey knows a lot can change in football and quickly too. “We’re going in the right direction at the minute, but we know in football it can change very quickly,” he said. “As much as we are enjoying it at the minute we know the hard work has to continue. “Hopefully we can stay in and around the top of the league. Glenavon face another tough examination this Saturday when they travel to last season’s league runners-up, Coleraine. The Bannsiders currently find themselves seven points off top spot after four draws on the bounce. But Tuffey knows they will be a tough nut to crack, especially at home. “It’s a huge game for us,” he admitted. “Coleraine are on a fantastic unbeaten run at home, it’s not an easy place to go, but we can only worry about ourselves. “Rodney (McAree) has gone in there and I’m sure he will be trying to implement his style and structure, and what he wants from the squad. Tuffey believes the Bannsiders example of blending youth and experience is a great recipe for success, and a great example for other clubs to follow. “When you have continuity and belief in yourselves and you add the quality young players who are hungry and have no fear along with one or two older heads to steady the ship I think that’s a great balance. 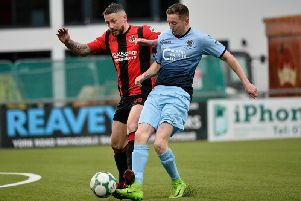 Bannsiders boss Rodney McAree believes his players need to stop worrying about league positions and start focusing on enjoying their football again. McAree feels the players’ frustration at drawing games, but said it is putting more pressure on them with every game they play. “The next game is against the league leaders and you don’t want to be going into that match too down on yourself,” he said. “We are more than capable of winning that game, and if we do win it we will be four points behind Glenavon, which isn’t a bad position to be in. “There are no trophies handed out at the end of September. “We could go and win the next four games and suddenly you’ve 12 points in the bag. The Bannsiders are unbeaten at home since December 2016 and McAree says to maintain that they need to be relaxed going into games. “The unbeaten run is in the back of everyone’s mind,” he said. “But Coleraine are unbeaten because they deserve to be. “Within that run I’ve no doubt they have probably rode their luck a little. “But the players deserve to enjoy the success of being unbeaten for so long.